Moose high tailing it away from us! Last night we moved to a little picnic area just before the turn off for Trout River town…around 9:15 when sun was setting. No one bothered us at the Trout River Pond so maybe we could have stayed overnight there but it was in the park so we moved to this picnic area out of the park. No one bothered to tell us to move out of this “no camping” area. Actually we weren’t camping, just parking for about 8 hours. No slides out, no lawn chairs…just a motorhome sitting there. There was some car noise late and early but nothing horrible. Woke up to rain…it cleared enough to do the Tablelands hike. 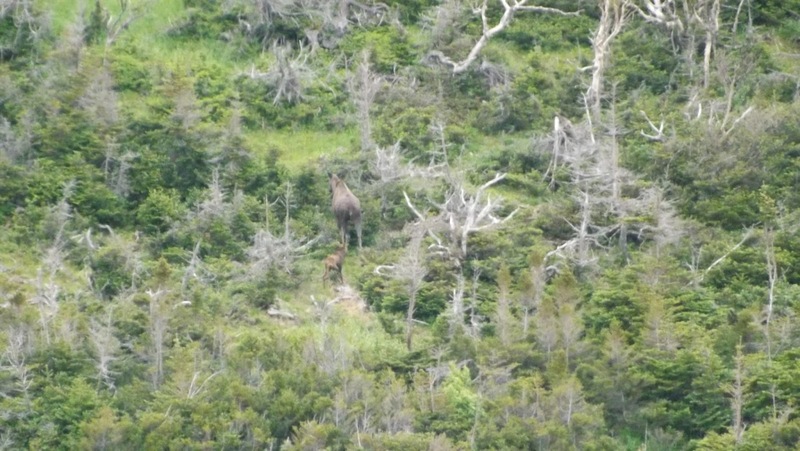 As we were driving to the trailhead for Tablelands, David spied mama Moose and baby moose down by the stream. Since they were really close to where we hiked yesterday, we’re betting that it was the same baby. Didn’t get a photo because as far as they were away (maybe two football fields), they still ran to get away. David started on the hike first because I told him to; he was going to go to the top of the mountain. I followed later and returned before he did since I only went to the bottom. 2.4 miles for Donna and don’t know what David’s was because it was up, up, up. 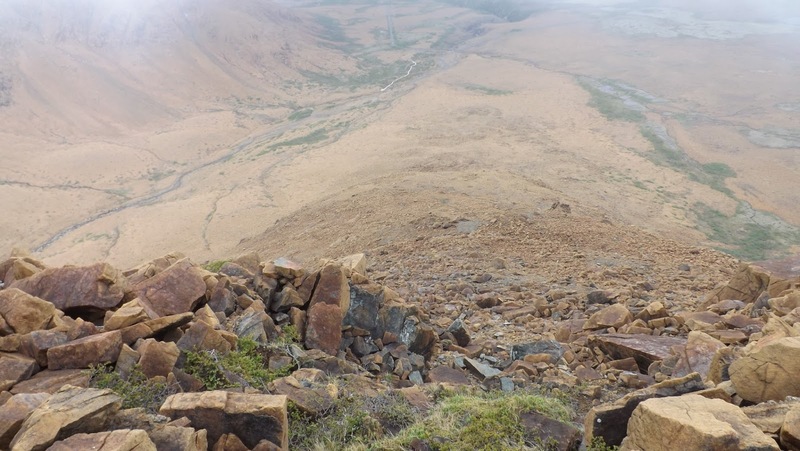 The tablelands are unique in that these are rocks that originally were from beneath the ocean pushed up when the Africa and North America collided (at least a few years ago…lol). Not much will grow on them as they are pretty toxic to most plants. Their color is a rust color which is very different than the other mountains around them (balsam fir, spruce, white birch). It is also a world heritage site/UNESCO. With that hike done we were off to explore some more. Took a quick look in Woody point and proceeded to drive up the coast. 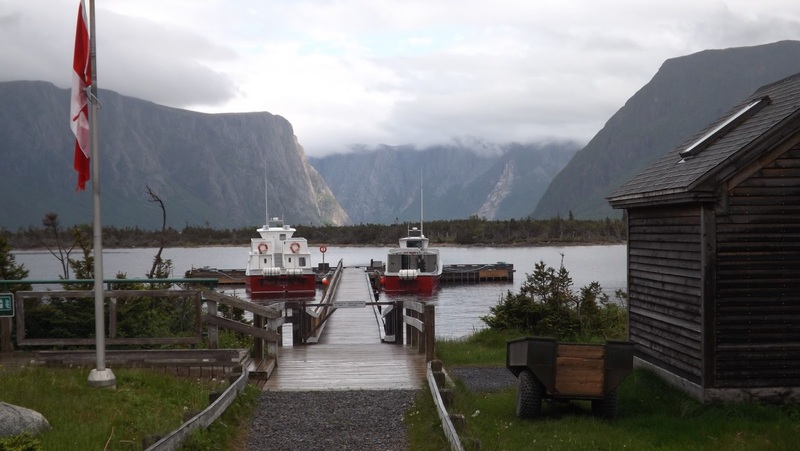 We were going to stop in Rocky Harbor; however, they made it real clear that there was no overnight parking. We elected t not spend any money there. 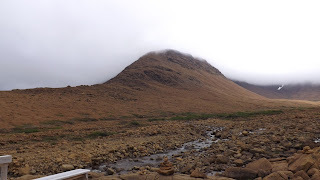 Stopped to check out Green Point Campground in Gros Morne (no one was staying at this campground) and would have liked to but it would have cost $35 to do so and there were no showers, no dump station. They did have a nice trail that followed the beach and some open sites which would have been good in case the bugs reappeared. Sally’s Cove looked picturesque. Western Brook Pond Trail was next on my list. 6km or 3.6 miles roughly and a bit of it was done in the rain. I was going to do this rain or shine. Nice easy trail. Got dive bombed by a bird or two on the way out. She went after me 3 times and David once and came within 3 or 4 feet of me. I waved wildly at her and she still did it. It had stopped raining by the time we arrived at the pond. If it had continued, we both would have been pretty wet by the time we returned to camper. We had no intention of doing the boat ride; years ago we took the coastal steamer up the coast of Norway (and nothing is topping that experience). It was beautiful scenery. Tall mountains in Gros Morne and should be a must see on everyone’s list. It was getting to be time to stop for the night and David selected the town of St. Paul (not in the park but the park extends beyond it) so we stopped at a picnic area by the road. There were not any no camping signs posted. We have mountain views some of them still have some snow on them! 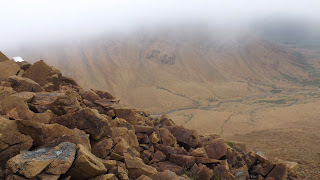 So no we are making our way up the Northern Peninsula of Newfoundland Canada.